Every evening during the European Meeting, brother Alois speaks to the participants. Here are the transcripts of his talks. To each and every one of you, who have arrived from all over Europe - and even some from beyond - I would like to say tonight: welcome to Basel! Welcome to this city which is so hospitable! I would also like to say a big thank-you to those who are welcoming us, not only in the city but throughout the surrounding region, in Switzerland, France, and Germany. For the first time, one of our European meetings is being held at the crossroads of three countries, and at the crossroads of two languages. Basel is a European city. Coming here, we would like to indicate that, when it comes to the construction of Europe there can be no going back. Basel is a city marked by the Protestant Reformation of the sixteenth century, a city where today many ecumenical initiatives are taking place. By gathering here, it is also the path towards the unity of Christians that we would like to highlight. It is a great joy to be together for five days, diverse as we are by our origins, our cultures, our denominations. Our joy is great but, of course, we all yearn for a joy that lasts longer than five days, an inexhaustible that never fails. An inexhaustible joy: you will have seen in the booklet that you received that this will be the topic of our searching during this meeting, and throughout the year that is beginning. "Be glad, rejoice with all your heart": we heard this invitation in the text of the Bible that was read earlier. Recently, in October, I thought it was important to go with one of my brothers to spend a week in South Sudan, then a week in Sudan, to better understand the situation of these two countries and to pray among those who are some of the most vulnerable people of our time. When I came back, I wondered: so many people, not only in Africa but also close to us, are suffering so much hardship, exclusion, violence, hunger, disease, exile, natural disasters. Is it possible to speak of joy, that joy which is one of the three realities - with simplicity and mercy - that Brother Roger placed at the heart of the life of our community of Taizé? So I thought about the children we met in refugee camps in Africa. While still very young, they have to undertake a large part of the daily chores but they welcomed us quite naturally with an extraordinary joy. Such an experience is not limited to Africa, it is possible everywhere in the world. We saw in Africa that, in places where so many dramatic stories are concentrated, the presence of children causes life to come bursting out. Their joy, the joy of innocent children, will too soon be broken when they become aware of the unjust trials imposed on them. But their joy is a ray of light by which we would like to let ourselves be enlightened. Where is the source of their joy? Tomorrow morning, you will reflect on the first of the four proposals that are made for the year 2018. It is entitled: "Dig deeper into the wellsprings of joy". And you will be able to think back to the biblical text that we read tonight: it invites us to joy and it also shows the source of joy by saying: "The Lord your God is with you". The joy of the Gospel comes from the confidence that we are loved by God, loved with the limitless love he has for each and every one of us. If, on leaving Basel, you retain only the certainty of this infinite love of God, source of joy, you will have retained the essential. In tomorrow evening’s prayer, I will try to indicate how the joy that flows from the love of God in no way involves running away from the problems of our time. On the contrary, it makes us even more sensitive to the distress of others. Last night, I told you that in October, with one of my brothers, I spent a week in South Sudan and a week in Sudan. When I came back, I thought about our meeting and wondered: how can I communicate to the young people gathered in Basel the cry of pain rising from the misery, the violence, the extreme fragility that we have witnessed in Africa? I also wondered: What can we do so that this cry is heard, so that the people who are suffering no longer have the impression that their cry is lost in the void? South Sudan is going through a moment of great difficulty that is provoking pessimism among many. They have no hope left. The country is suffering from galloping inflation, wages have not been paid for several months, violence is spreading and many weapons are circulating. At the house of Mother Teresa’s sisters, I saw mothers bringing in their undernourished children. Sometimes a nine- or ten-year-old girl brings along her little brother. To go to the market to sell something, these mothers walk for whole days, in crushing heat, carrying their goods on their heads and holding a baby in a goatskin sling. The following week, in Sudan, another woman impressed me, Samir’s mother. Who is Samir? He was one of the young refugees we welcomed two years ago. He arrived in Taizé after a very trying journey and, soon after his arrival, quite unexpectedly, he had a heart attack and died. The other young refugees took charge of his funeral with the imam of our region. In Sudan, I told all these events to his mother. At each sentence she nodded in approval, with the words, "Al hamdulillah, praise to God". Then she explained to me, "He was my only son. My husband had left me. I am sick. I sold our house to pay for Samir’s journey.” And this Muslim woman added these words that the Bible places in Job’s mouth: "God gave, God has taken back. Thanks be to God." It seemed to me that all of us could see, through this woman, all the mothers in the world who are suffering for their children. These stories are poignant. But in Europe too, sometimes near us, there are serious situations, experienced by people wounded by life. Through the gospel that we have read tonight, we know that, as a man, Christ Jesus is united to every human being. He is there in every person, he is there especially in the person who is most abandoned. What we do to the littlest ones, it is to him that we do it. So I would like to share with you my experience: when we hear from nearby the cry of a wounded person, when we look in their eyes, when we listen, when we touch those who suffer, we are brought closer to Jesus, who is poor among the poor, they bring us into greater intimacy with him. The personal meeting with the most vulnerable makes us discover the dignity of the other and allows us to receive what even the most deprived transmit. Do they not make an irreplaceable contribution to building a more fraternal society? They reveal to us our own vulnerability. By that they make us more humble, more humane. And paradoxically a joy is given, it may perhaps only be a spark, but it is a true joy that the poorest share with us. Tomorrow morning in the small groups, you will reflect: how can we better listen to the cry of the most vulnerable and respond to it with our lives? How can we hear what they have to communicate to us? They help us to get free of problems that are not essential and to rejoice in becoming simpler, more humane. Their courage renews our courage. For the past two days, I have shared with you several accounts of the visit I and one of my brothers made to the poorest people in South Sudan and Sudan, because this visit left me with many questions. In the Gospel, Jesus has just told us "Blessed are you who are poor, for the Kingdom of God is yours.” What does he mean by such words? In South Sudan, in a camp for displaced people, the courage of the women touched me. One woman told how she seeks to be a creator of reconciliation and peace. The water is rationed. Sometimes quarrels arise near the pumps. So a group of women has been formed to ensure fair distribution. This woman said to me: "It is by sharing the water and going beyond ’every woman for herself’ that we build peace". That woman had understood that peace begins in ourselves, fraternity is built around us, on the basis of our concrete, daily lives. We who are gathered around Christ know that the Gospel carries a message of universal fraternity. The unity that Christ brought about between God and human beings leads to a reconciliation of each person in themselves - peace of heart -, a reconciliation among humans - peace on earth - and a reconciliation of the human family with the creation. In this spirit, which has been manifested here in Basel and the surrounding region for a long time, the Christians of the various Churches have come together, Protestant, Catholic, and Orthodox, to prepare to receive us. We thank them for inviting us. We thank everyone who has opened their doors to welcome us so warmly. Thank you also to the civil authorities who added their collaboration. A year ago, visiting Lutherans in Lund, Sweden, on the eve of the 500th anniversary of the Reformation, Pope Francis expressed in a prayer words never before formulated by a pope. He said, "Holy Spirit, grant us to acknowledge joyfully the gifts that have come to the Church through the Reformation." Reconciliation between churches is a journey towards a new reality whose contours are unexpected and still unknown. We should recall this word of the prophet Isaiah: "I will guide the blind on paths they had never followed.” The Holy Spirit will guide us on paths that we do not know beforehand. Throughout 2018, we will ask the Holy Spirit to prepare us to become ever more, through our lives, witnesses of reconciliation and peace. For this we will continue our pilgrimage of trust on earth. I will now indicate some steps. In Taizé, youth meetings will continue each week, with two special moments: in July a weekend of friendship between young Christians and Muslims, allowing us to see what unites us and what is different; in August a week of reflection reserved for young adults aged 18 to 35, to dig deeper together into the wellsprings of joy. As I already said last year, this year we will have the seventh international youth meeting in Asia, and of course it will also be open to young people from other continents. Everyone will be welcome. It will take place from August 8th to 12th. It will be held in the city of Hong Kong. Before this, we will hold an international meeting of young adults in a country that is very dear to our hearts and where we have never yet prepared such a gathering. There are here 2800 young people who have come from this country. It will take place from 28 April to 1 May. This meeting will be in Ukraine, in the city of Lviv. From 25 to 28 October, another meeting will bring together young adults from several countries from the centre of Europe. It will take place in Austria, in the city of Graz. Then will come the European Meeting. Last year, we were in the north of Europe, in Riga. Next year, we will go to the south, to a city where we have never held a European Meeting. In the south, on the Iberian Peninsula, we have already been warmly welcomed in Barcelona several times, and also in Lisbon and Valencia. Next year, from 28 December 2018 to 1 January 2019, we have been invited to gather together in the city of Madrid. We have just heard Jesus affirm in the Gospel that he is the good shepherd, that he has other sheep, and that there will be only one flock with one shepherd. He came to earth not only for a small group but to unite the whole human family. Hence our hope for peace in humanity. It is with great hope that tonight we will pray for peace. It is true that peace is threatened and I would like to recall two of the major challenges facing the human family today. The first is the one represented by these multitudes of men, women, and children, who everywhere on earth are forced to leave their place of origin. The reasons that drive them to leave are various: it may be war and insecurity, it may be extreme poverty and a lack of any future, or climatic disruption. In their distress, these people need solidarity and, as we have witnessed in Taizé, they can become our friends. It is as if Christ invites us to go beyond our fears and our prejudices, it is as if he were telling us: "I am the shepherd of all humankind. I died for them too, whether they are Christians or not. So you can become their friend." The second challenge comes from our planet, which is also vulnerable. Listen to the cry of the Earth. In the face of ecological disasters, particularly in the poorest regions, Western countries bear a historic responsibility. Multiple initiatives are being taken at all levels. They remain insufficient. On behalf of all of us here, I venture to address this call to those with political and economic responsibilities: the financial means for the necessary changes exist. So let them be steered towards eradicating poverty and taking care of the environment! These two challenges threatening peace are immense but we will not be discouraged. During these days we have come close to the wellsprings of a joy that never fails. We can let this spring come welling up in our hearts. It will give each and every one the courage to be engaged where possible, to make a contribution, even a modest one, to the search for solutions. To prepare peace, we long to promote the growth of fraternity. For that, it is essential to open ourselves to other cultures and mentalities. Sometimes that can take us very far. Before going to South Sudan and Sudan, we were in another part of Africa that has also been experiencing hardships. With two of my brothers, we were in Egypt for a youth meeting. One hundred young people had arrived from Europe, North America, Africa and the Middle East. They were welcomed by one hundred young Orthodox Copts from Cairo, Alexandria and Upper Egypt. For five days we discovered the long and rich Coptic Orthodox tradition of the Church of Egypt. In Taizé, throughout the summer, we had already welcomed young Arab Christians, Copts from Egypt, Catholics and Orthodox from Lebanon, Jordan, Iraq and Palestine. Their three-month stay on our hill brought us closer to the Middle East. They transmitted to us their thirst for peace. We would like to be ever closer to young Arab Christians. In a few months’ time we will make another pilgrimage. It will be too far for many people to go, it will be a simple visit but it will deepen links with the Orthodox Church. It will delight the Russians who are gathered here tonight in the Arena. From May 16 to 19, with some of my brothers and some young people, we will participate in the Orthodox celebrations of the Ascension in far-off Siberia, in Kemerovo. Promoting the growth of fraternity is something that can take us very far, but it starts close beside us, at our very door. Once back home, let us go beyond barriers, exchange with those who think differently than ourselves, build bridges: between religions, between regions, between European countries, between continents. Let us go towards those who are most vulnerable. For example, let us listen to a homeless person telling his story, or a person with a disability, a sick person or a refugee. Then we will see our hearts open, expand, become more human, and even discover joy. 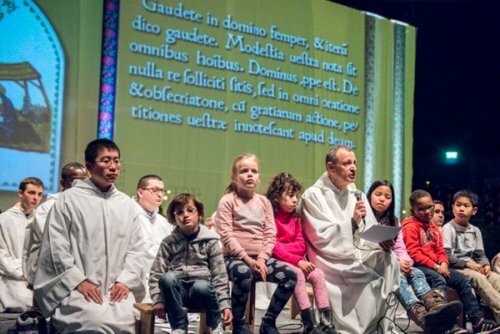 So let us take away from this meeting in Basel one last word: every human being is made for joy and joy is not something with a vocation to be kept for oneself, it is meant to be shared. The joy that has its source, its wellspring in the love of God, the joy that never fails, is the secret spring of a commitment on behalf of others that will never weaken, never fail.